Crystalens AO™ represents a significant advance in intraocular vision correction technology and North Central Florida’s leader in Crystalens AO™ are the ophthalmologists at Ocala Eye. 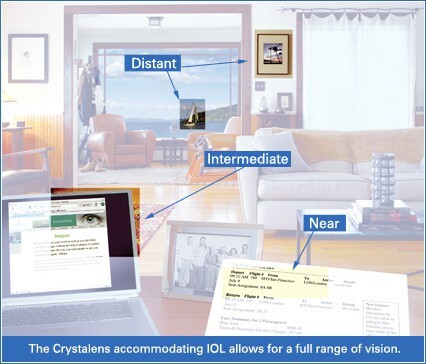 Unlike other cataract IOL (intraocular lens) options, the revolutionary Crystalens AO™ is the only vision solution that works with the muscles in your eye to provide a complete range of sight from near to far and all distances in between – reducing or possibly eliminating the need for glasses. 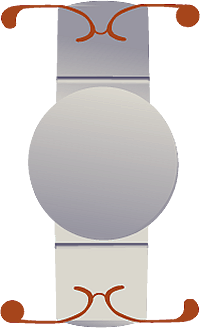 The design element that makes Crystalens AO™ a unique replacement lens for cataract and other surgeries is “hinges” which allow the lens to move, or accommodate in response to contraction of the ocular muscles. This accommodation simulates the natural focusing mechanism of the eye. Crystalens AO lens implants are the first and only accommodating intraocular lenses approved by the Food and Drug Administration (FDA). Crystalens AO lens implants are the first and only accommodating intraocular lenses approved by the Food and Drug Administration. Choosing Crystalens AO as your IOL can reduce your dependency on reading glasses after lens replacement surgery such as cataract surgery. Compared with multi-focal IOLs the Crystalens AO also holds advantages in intermediate distance vision and lowered incidence of glare when driving at night. Recent Medicare changes now qualify a portion of the Crystalens AO procedure for cataract coverage. This leaves a residual out of pocket cost that you would pay for the near vision correction features of the Crystalens AO. Ocala Eye features payment plans that make the Crystalens AO a viable choice for your lens replacement surgery. In addition you will receive an entire year of follow up care which includes vision enhancement such as LASIK or CK® if deemed necessary by your Ocala Eye physician to fine tune your vision. One of our highly skilled ophthalmologists will determine if you are a candidate for Crystalens AO lens implants. At our Ocala, Florida, eye care offices, we carefully evaluate each patient, performing a thorough eye examination and reviewing medical history to ensure you are a good candidate for the procedure. The actual surgery for Crystalens AO lens implants is performed as an outpatient procedure at our Ocala surgery center and the actual operation takes less than 30 minutes. Your surgeon will provide you with specific instructions to follow after you receive your Crystalens AO lens implants. Patients who already have intraocular lens implants from previous cataract surgery are not candidates for the Crystalens AO.